My first experience with NBA Full Court Press came at a friend’s house, not long after the game was released. At the time, I was all about the PC version of NBA Live 96, but NBA Full Court Press was certainly intriguing. 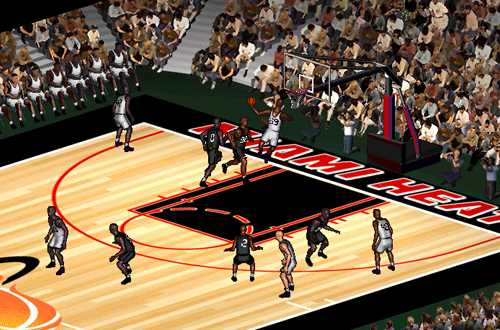 A Windows release – not just a Windows-compatible MS-DOS game like NBA Live 96 – NBA Full Court Press featured some crisp animations, play-by-play commentary from Kevin Calabro, and logos that were updated for the 1997 season. Full and twenty second timeouts were represented, and the interface was slick and stylish. At first glance, it seemed like it might be a worthy competitor to EA Sports’ “back-to-back champion“. However, on closer inspection, the game clearly had a lot of flaws. Players looked virtually identical, jerseys lacked detail, and the gameplay was arcade-like in terms of pace and shooting percentages. Strategy was minimal, and despite the presence of dunk ratings, nearly every player could throw it down. The AI often broke down, just dribbling out the shot clock and getting three and five second violations. There are too many interceptions and unnecessary jump passes. It has some nice dribbling and dunk animations, but the rims and nets are completely static. Substitutions happen too often and at the wrong times, and there’s no free throw mechanic or meter. Another authenticity issue is painfully apparent with the game’s rosters. 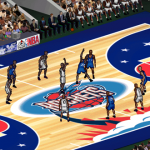 Although the team artwork had been updated for the 1997 season, NBA Full Court Press featured final 1996 rosters, minus Michael Jordan, Charles Barkley, and Shaquille O’Neal, who was exclusive to NBA Live 97. The Season mode schedule was also from 1996, making it something of a throwback to EA’s NBA Playoffs series, or even the Super Nintendo and SEGA Genesis versions of NBA Live 95. Obviously, there were no Class of 1996 rookies either, which left the game stuck awkwardly between being set in the 1996 and 1997 seasons. There are roster editing functions, but they’re some of the most cumbersome editing tools you’ll ever find in a basketball video game. It’s possible to change team jersey colours and edit and rename players, which in theory allows you to create missing players. There are custom teams, including one called the Thunder, funnily enough. Unfortunately, player movement is clunky, and tends to have undesirable side effects, such as replacing players on other teams. For example, editing Michael Jordan into the game and putting him at shooting guard on the Bulls, where Scottie Pippen starts by default, also replaces Pippen on the East All-Stars. By default, the action takes place in the top two thirds of the screen, while info such as the time remaining and the number of team fouls are displayed in the lower third, along with the portraits of the players currently being controlled and their respective fatigue meters. A full-screen option is also available, and can be activated with a hotkey. 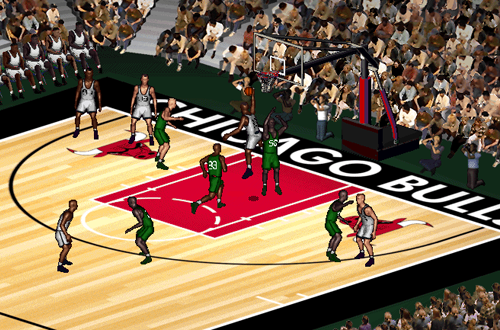 The game is played at an isometric camera angle, similar to NBA Live 95 and the Classic Cams in 96 and 97, with a score bug in the top left corner. The court is rather small though, which along with the lacklustre AI, makes for bad spacing as players tend to cluster together. This also contributes to the number of interceptions. Kevin Calabro’s commentary does add a level of authenticity that was lacking in other NBA games at the time. The former long-time voice of the Seattle SuperSonics was one of the league’s best announcers, and his distinct voice and vast repertoire of catchphrases and expressions do enhance the atmosphere. NBA Full Court Press is definitely more impressive in terms of audio than the visuals, however, with the lack of detail on players and static environment being a disappointment. Elements such as player introductions are nice, but they’re ultimately overshadowed by the myriad of gameplay and functionality issues. Although there are commendable elements and attention to detail with features such as the separate full and twenty second timeouts, they thinly mask the game’s overall mediocrity. From the gameplay lacking in realism to an inability to easily identify the players, to mistakes with the rules and a lack of sophisticated mechanics and roster customisation options, it doesn’t have the depth and polish of its contemporaries. There are Season, Playoffs, and Practice modes, but they’re nothing special. In a nutshell, NBA Full Court Press’s problem is that it favoured flash over substance, and even then, it came up a little short, especially in terms of the graphics. On top of that, the outdated rosters were obviously also an issue. By that time, NBA video games were expected to be ready for the current season. Even if certain players couldn’t be included – namely MJ, Sir Charles, and Shaq – the rosters were otherwise expected to be up to date, reflecting offseason trades and adding the new rookie class. NBA Full Court Press was a game set in the 1996 season that came out as the 1997 season was getting underway, with roster editing functionality that made it difficult to update it accordingly, and no placeholder Roster Players that might’ve made that task just a little bit easier to accomplish. Overall, it was no competition for NBA Live 97. With all that being said, as far as a more casual approach to five-on-five gameplay is concerned, NBA Full Court Press could potentially deliver a satisfactory experience. It was a more serious approach to virtual basketball than games like NBA Jam, but less realistic than what EA was aiming for with NBA Live. It probably held more appeal to a casual basketball gamer like my friend, but even as a more serious fan of the genre, I found some fun and appeal in it. When I saw it in a bargain bin at a computer store a couple of years later, I didn’t hesitate to pick it up. I still have that same copy of the game, and it’s interesting to revisit it every now and again. At the very least, we can appreciate the more innovative things that games like NBA Full Court Press did, as they no doubt influenced other titles to adopt some of their better ideas. 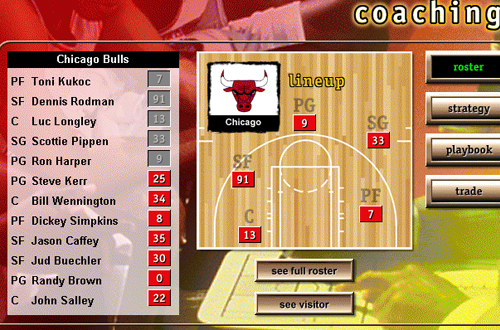 The very next year, NBA Live 98 featured play-by-play commentary, as well as in-game player editing. NBA Full Court Press also proved to be a worthwhile learning experience for Microsoft, as their short-lived NBA Inside Drive series would later go on to be a respectable competitor to NBA Live and NBA 2K for a few years in the early 2000s. It’s a flawed title, but it has its place in basketball gaming history.